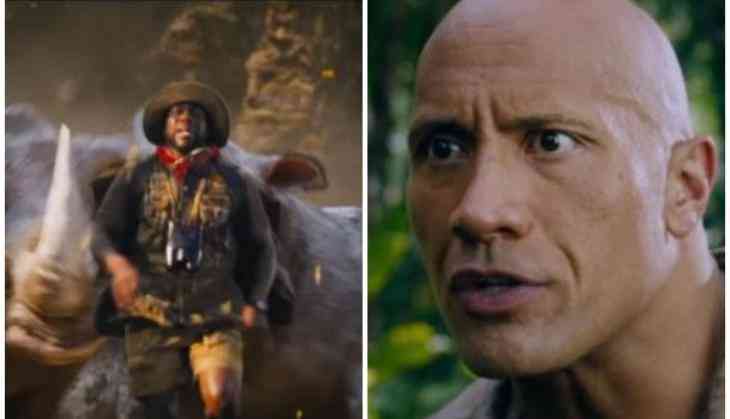 'The Game has Changed' in the first trailer of the 'Jumanji: Welcome to the Jungle'. The Rock unveiled the trailer of his upcoming movie on Twitter and it will surely make fans go insane. The trailer starts with four teenagers in high school detention uncover the old video game Jumanji. The teens turn into the characters played by Dwayne, Kevin Hart, Karen Gillan and Jack Black. The blonde teen girl named Betheny who pronounced herself "too pretty" to work during detention becomes the character played by Jack. As Betheny sees her new avatar, she says, "I am an over-weight middle-aged man." As the footage moves forward, they all discover their video game characters' "special skills" and face all the challenges of the wild. A rhinoceros stampede, a raging hippopotamus and a massive squad of flame-throwing motorcyclists are just a few of the things they're up against. The trailer is action-packed and gives a sense of adventure that fans are going to witness. The background music features 1987 Guns N' Roses song ' Welcome to the Jungle,' which enhances the whole feeling of the trailer. The original 'Jumanji' had revolved about a board game rather than a video game. In a brief clip introducing the trailer, Dwayne, dressed in his character's khaki gear, said, "Yo, what's going on, guys? Rock here. I'm super pumped you're all gonna check out my new movie Jumanji. I play a world explorer." The movie stars Dwayne Johnson, Kevin Hart, Karen Gillan and Jack Black in pivotal roles. The flick is slated for a December 20 release.